The Toyo submersible pumps are specially designed to pick up and transport abrasive materials with the least amount of water. 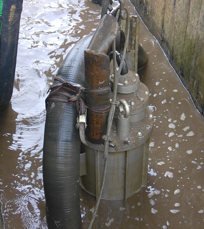 These submersible pumps, operating directly in the slurry, are low noise machines. They do not require any special construction for their installation. Some compact series, with top outlet discharge, offer the possibility to work in narrow spaces as well (e.g. foundation piling). The Toyo submersible pumps incorporate the patented Toyo agitator, attached directly to the shaft of the pump, in a configuration that results in one of the most rugged submersible slurry pump available on the market. The rotation of the Toyo patented built in agitator lifts the sediments and creates a homogeneous slurry mixture. This makes continuous pumping of slurries with high concentration of solids possible. Heavy duty design, careful selection of materials and parts as well as unique component shapes combined with powerful slow running high torque motors have produced pumps with excellent abrasion resistance, very efficient in heavy slurries pumping. These characteristics ensure long service life and economical operation.